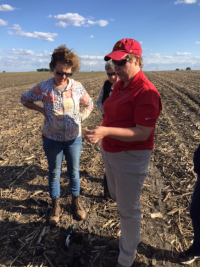 AMES, Iowa – Women landowners, farmers and ag retailers will be meeting once again starting Oct. 18 for the Agronomy in the Field program, hosted by Angie Rieck-Hinz, Iowa State University Extension and Outreach. Agronomy in the Field for women is in its second year and currently serves nearly 60 women in north central Iowa. The goal of the program is to increase agronomic knowledge from planting through harvest by spending time in the field. Sessions for Agronomy in the Field were postponed for the last six weeks due to harvest preparation, but will resume on Oct. 18 and continue through March 2017 in a classroom setting. Meetings will occur on the third Tuesday of each month at 6 p.m. at the ISU Webster County Extension Office in Fort Dodge, Iowa. For the first time, the sessions will also be offered by a web-conferencing program for those who are unable to travel to the meeting location. “It can be hard to travel in the fall and winter months with the harvest season and weather challenges, so hopefully the web-conferencing technology will allow women across the state to still be a part of the program, even if they are unable to physically be in the same location,” said Rieck-Hinz. 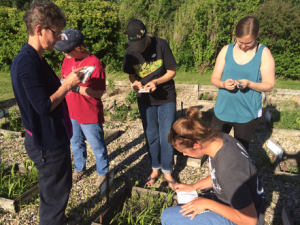 This spring and summer, women from across the state traveled to the Smeltzer Iowa Learning Farm near Otho, Iowa and to the Northern Iowa Research Farm in Kanawha, Iowa for the Agronomy in the Field program. Information and resources about crop growth and development, seed treatments, weed identification and conservation practices were some of the topics discussed at the meetings. Guest speakers were also invited to present information on insect and crop disease identification and water quality. The groups also spent time in the field, learning about corn and soybean growth stages and conducting population counts. Planned learning sessions for this fall and winter include: soil sampling, phosphorus and potassium management for soil fertility; pH, lime and micronutrients; nitrogen management; managing for herbicide resistant weeds; a GMO discussion; and other topics chosen by the current Agronomy in the Field participants. 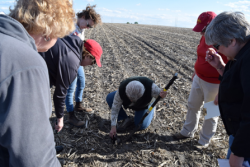 Any Interested women landowners, farmers and service providers who would like to participate in upcoming sessions should contact ISU Extension and Outreach Field Agronomist, Angie Rieck-Hinz, at 515-231-2830 or amrieck@iastate.edu prior to Oct.18, so accommodations can made for in-person or via web-conferencing. Agronomy in the Field is sponsored by Iowa State University Extension and Outreach and the Webster County Extension Office.